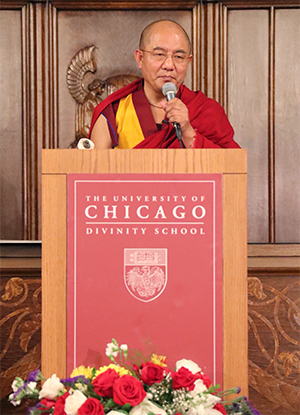 Khenpo Sodargye Rinpoche discussed the type of mentality one needs when living in turbulent times. Whether it involves facing disruption in one’s country or dealing with the ups and downs in our personal lives, it is crucial that we acquire the right mentality. So what do we need and how do we achieve it? 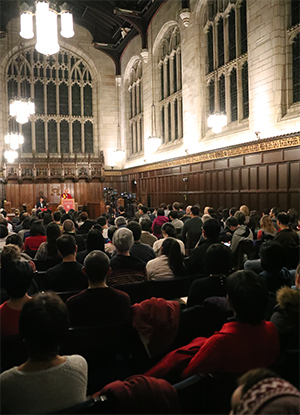 Khenpo offered four points of advice: to calm down, to see though phenomena, to realize the true nature of it, then to accept it and let it go. Now that we are in the 21stCentury, it is crucial that we do not abandon our traditional religious beliefs or our traditional culture. At the same time, we need skills to adapt to this new technological age. The idea of integrating tradition with modernity may not sit well with some young people, but it is nevertheless essential to bring together the culture, religion and science of the east and west and to rise to the challenges the modern societypresentswith traditional wisdom. How do we handle suffering like illness, aging, relationship problems and so on? According to Buddhism, it’s important to tap into our mind and discern the situation or problem so that we can transform our afflictions and pain into wisdom and joy. Even if something cannot be changed, we can find ways to accept it. Buddhism teaches that all things are created by the mind. This doesn’t repudiate what happens around us, but only that is more related to our mind than to external phenomena. Sometimes we can’t change some of the things that happen in our lives. So we experience a lot of pain. But if we can’t change the world, at least we can change our mind. We can calm our mind so as not be overwhelmed by negative emotions which will only worsen the situation. For example, losing a job or being rejected in a relationship generates strong emotions and this will influence how one deals with other situations. Instead of being abducted by our emotions, we should try to stay calm, let go of our negative thoughts and adopt a new attitude towards the situation. There are many teachings within Buddhism that tell us how to adopt a new attitude and how to know our mind. When mental affliction strikes, instead of complaining about it, try to stay calm and just observe what is behind it. A famous verse in Buddhism runs: “All phenomena arise from causes and that which is their cessation.”Another states, “This being, that becomes. From the arising of this; that arises.”Phenomena occur when cause and condition come together, when they separate, phenomena cease to exist. Understanding such profound teachings will enable us to face adversity with calm rather than distress. An old saying runs: life is full of ups and downs. A prosperous country can experience economic decline; the same can happen to a family. Life comes with both success and difficulties which is exactly the expression of impermanence presented in Buddhism. Then should we just let it be? No. We should face up to it bravely with wisdom, just as do the Bodhisattvas in Buddhism. Bodhisattva means “one with a brave heart”. And this means that no matter what the situation, a Bodhisattva will not react with the distressor self-imposed isolationthat often results in depression today. So it is very important that we bravely embrace everything with wisdom.